Round two – or three? Or round two part two? 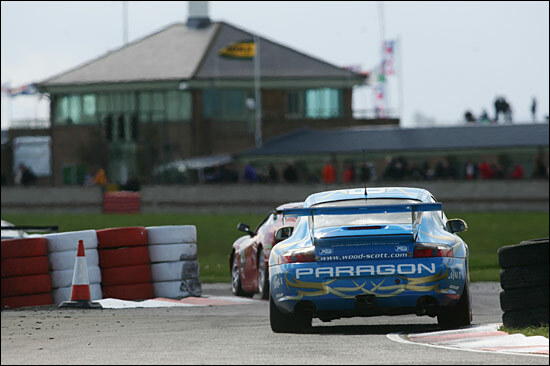 With the GT2 cars having raced at Magny-Cours a week earlier, the GT3s had Croft to themselves on May 7-8. Twenty of them chose to take this opportunity to go for an overall win, and eleven of them were Porsches. So there were plenty of rivals for Stuart Scott and Steve Wood to face up to, in a pair of one hour races, the first on Saturday afternoon. Stuart was down to start this one, having qualified in the first of two sessions earlier in the day. The weather was dry and blustery – but it turned wet and blustery before the end of the 60 minutes. Steve Wood likes tricky conditions…. Stuart got away well and finished the first lap in a strong 13th. 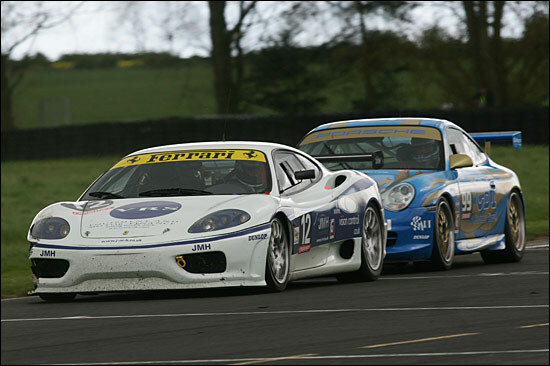 That became 14th a lap later, as Phil Burton slipped by in his Ferrari. That set up an interesting dice throughout the stint, Stuart hanging on well to two Ferrari 360s: Hector Lester was just ahead of he and Burton. “My plan was to stay as close to them as possible,” said Stuart later. The only change was that Burton passed Lester: otherwise the three of them circulated in close company – and were nicely poised when a Safety Car period interrupted the racing, to retrieve another Ferrari. The timing was perfect – Stuart ducking into the pitlane after 17 laps, from 12th, for a quick change to Steve Wood. The Safety Car didn’t pick up the leader, so Steve found himself in a group of six cars that by rights should have been waved past rather smartly. One of them was… and then there was a pause. Eventually though the Clerk of the Course gave the instruction for the remaining five to pass the SC and catch up to the tail of the field. Now Steve was in his rightful place – eleventh – in the race and on the track. And the rain started to fall – plus a sprinkling of hail. Perfect! 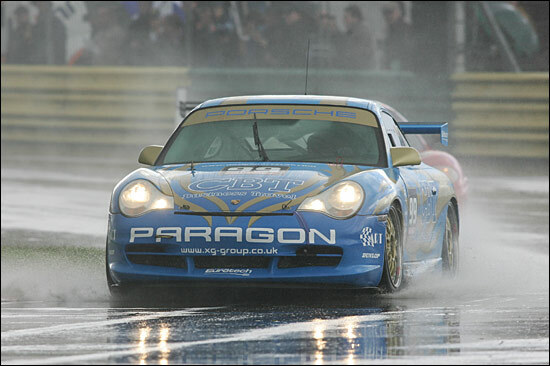 Within a lap the Wood-Scott Racing Porsche was ninth, then eighth – with more places about to be gained. But four laps to go and Steve was still eighth – having been passed by Ian Flux. The pair of them then picked off a Porsche on lap 35, another on lap 36, and completing lap 37, Steve was on the tail of the lone Morgan. 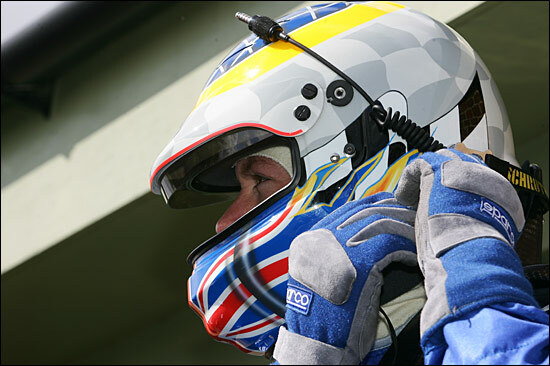 He grabbed that place, the Porsche driver much happier than the Morgan one, on slicks in the wet – and in the charge to the line, Steve was the second fastest man on the track, over two seconds faster than Flux up ahead. They crossed the line exactly a tenth of a second apart, the blue Wood-Scott Racing GT3 in an excellent fifth place. 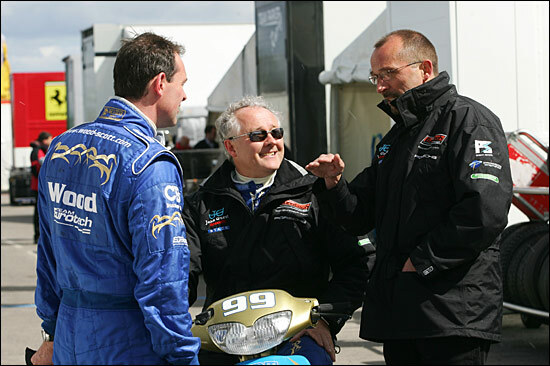 Eurotech boss Mike Jordan couldn’t work out why Stuart should like a fast, lively bumpy old track like Croft, but like it he does. With Steve liking tricky conditions, and with plenty of those on offer on Sunday, could they match or beat Saturday’s fifth place? 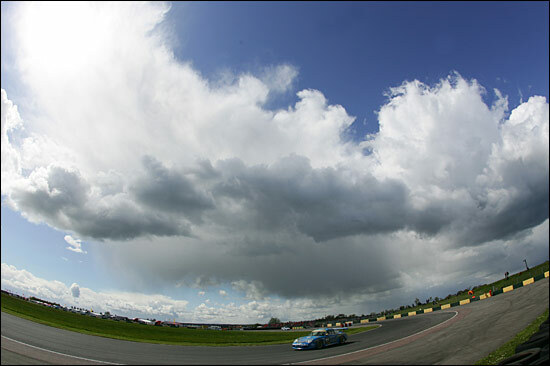 The smattering of hail on Saturday was easily beaten by Sunday’s deluge of the hard, white stuff – fortunately at lunchtime, well before the start of the second GT race of the weekend. Then it looked as though it might dry out, then it rained again, so wets were the obvious choice of tyre, weren’t they? No, Steve Wood set off on intermediates, along with two or three others – one of whom, Ian Flux, ‘chickened out’ after a very hairy first lap, and came in for wets. Steve stayed out though, and found it very difficult initially… well not difficult exactly, because he loves these tricky conditions, but it was very difficult to make any headway. Until the track started to become a little less wet. At one point he was the fastest man on the track, down into the 1:33s while the leaders were in the 1:35s – but he was in 12th place, with the pit stop looming. 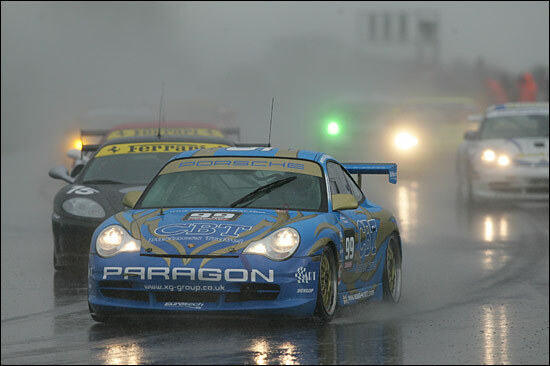 The blue Porsche stayed on intermediates, but poor Stuart then found the rain coming down again, and he began to slither around, eventually coming home a frustrated fifteenth. Oh well – on another day, intermediates could have been an inspired choice. Steve Wood enjoyed the race though – but then he would probably have enjoyed it on slicks. 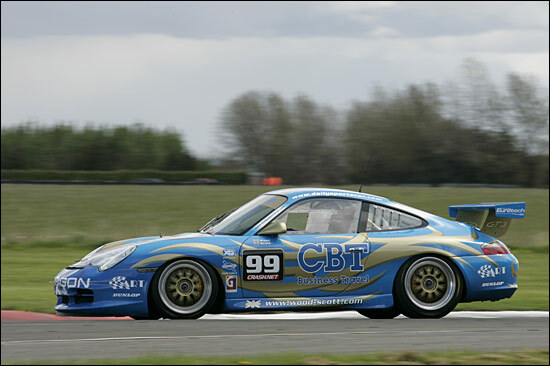 The next pair of races is at Knockhill on May 21-22 – and the GT2s will be joining the fray again.